Cambridge, UK, June 2014: Already the mainstay of many top mastering studios, SADiE's internationally acclaimed SADiE 6 software is set to deliver even greater benefits to the mastering community thanks to the inclusion of a brand new toolset, which is specifically designed for today's 'digital download' age. With many more consumers now choosing to buy their music via a download, record labels are increasingly asking mastering engineers to deliver mastered audio as digital WAV files so they can be easily uploaded to sites such as iTunes, Napster and Amazon. Developed by Microsoft and IBM, the WAV format is also popular as a master archive wrapper because it offers long-term content security and is widely accepted by both the professional audio industry and the archiving community. SADiE's newly introduced WAV Master feature allows users to create WAV files for an entire album, using PQ marks to define the start and end of the WAV file for each album track. Track Titles, Artist Name and other information is automatically incorporated into these files. As a further extension of its WAV Master feature, SADiE has also introduced a new high quality Sample Rate conversion algorithm. This brings the sample rate conversion process in-line with the high quality processing standards for which SADiE's parent company, Prism Sound, is famous. Resolution changes can also be applied during the bounce process that is used to create WAV files, and a printout of the album can be produced listing detailed information about each file. 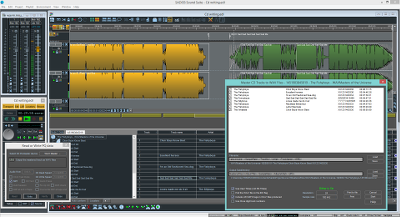 This ultra-efficient workflow allows SADiE's PQ list to be used as a single source to create the WAVs, DDP and CDs that are required by today's mastering engineers. Created and standardised by the European Broadcasting Union, Broadcast WAV (BWF) is an extended WAV format that allows ISRC data to be embedded in the file. ISRC stands for International Standard Recording Code. Every song released, and every version of that song, is allocated a unique ISRC by the record label. ISRC is then used to ensure that the correct files are used for playback and replication. It also ensures that artists and recording professionals who stand to benefit financially from any playback or replication are identified and compensated. Ordinary WAV files can't carry embedded ISRC data, therefore the only way to be certain that this vital data flows throughout the entire production chain is for the music industry to adopt BWF as standard. The UK Music Producer's Guild has led the initiative to get BWF adopted as standard, and in conjunction with the EBU it has produced a Recommended Practice document that lays out methods by which an ISRC can be embedded into a BWF. Exactly how workflows will use this embedded ISRC is yet to be fully defined, but having software that supports it is a prerequisite. Along with other manufacturers that create software for mastering, SADiE has played an important part in this initiative by contributing to the working group that drew up the Recommended Practice document. This states that all mastering software should allow for the implementation of BWF and should give mastering engineers the ability to exchange BWF files incorporating ISRC. We are delighted to announce that SADiE's ISRC in BWF feature, which is incorporated into the new WAV Master option, does all of this. 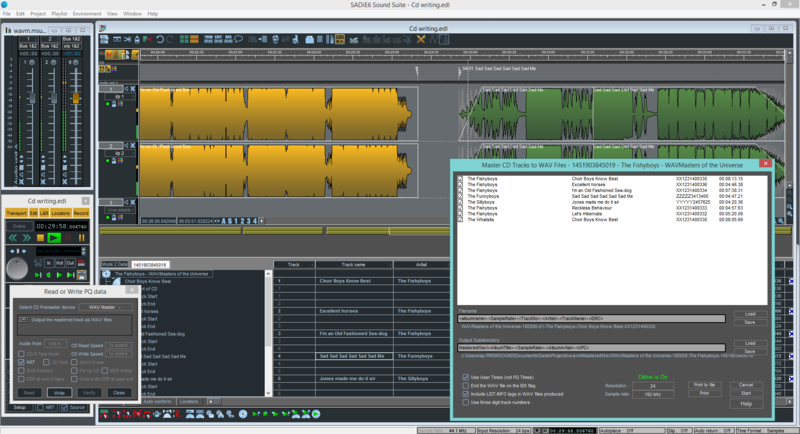 This feature is also included in the SADIE version 6.1 update as part of the "Mastering Suite" and "Sound Suite" packs. SADiE has implemented this feature so that it provides a complete workflow for handling Broadcast WAV files with embedded ISRCs. SADiE will follow up this update by adding enhanced video support for Blackmagic Design Decklink cards, as well as timecode support on SADiE Native systems (where the ASIO audio hardware used supports timecode functionality) . To try out the software for yourself, please go to SADiE 6 download request page or contact your local dealer for further information.